Chair yoga is yoga. This article offers 8 reasons you, yes you, might now or someday incorporate chair yoga into your repertoire. Downward facing dog with the chair. I maintain that the widespread impression of yoga as a physical-only exercise remains quite persistent. Conversations with potential students fairly new to yoga confirm my assertion. Media, selfies, and marketing portray individuals realizing challenging and impressive postures. Fine with me. I’ve posted such pictures of myself in those postures.Working with the mind/body to achieve a pose can definitely empower and shift consciousness. Human abilities are breath taking! Recent initiatives have expanded the image of the yoga practitioner as more than striking impressive poses. Additionally, there is increased representation of the spectrum of human shapes, ethnicities and abilities, Google “yoga for (fill in the blank”). Concomitantly, even those efforts persist in depicting individuals striking asasnas (poses) that are daunting for many people, and poses some may never achieve for particular physical or age related reasons. All tools of yoga, (not only the physical poses) can and must be adapted by a skilled teacher to the needs of the individual whom they are guiding at that moment in time. In working with a variety of populations, I have facilitated classes introducing many of these time tested yogic practices including pranayama (breathwork), asana (physical postures and exercises), and dhyana (meditation or single pointed focus)*. Chair Yoga is Yoga is Yoga. (to riff on Lin-Manuel Miranda) . The practice is yoga. We happen to use the chair as a prop. You’re stuck in an airport and you don’t want to get on the yukky floor. Your standing movement is restricted and heavy from pregnancy such as carrying twins or late in third trimester, or you need to modify the practice for medical reasons. You are about to have, or are recovering from surgery such as knee replacement. You are recovering from an injury. You are learning balance and the chair can help you safely do so. Your balance is challenged and knowing the chair is available helps you practice standing poses. Current physical limitations such as weight or different abilities require a seated practice or support of a chair. 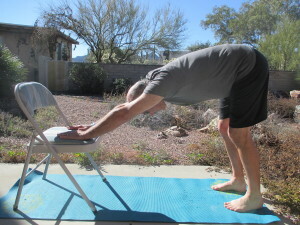 This video is for anyone who may benefit from chair yoga as described above. You might not feel you need it at this moment in your life. You may know someone who would like to try yoga and this can be their entrée. You may be curious about chair yoga. I give you my first effort in videotaping a gentle chair based practice. The first part is seated, the second part is standing using the chair for balance. Simple but not necessarily easy. Check out current schedule for upcoming offerings.